This week marks the start of new segment for Mondays with Marts as X-Men Senior Editor Mike Marts interviews one of the creators currently working on the X-books. First up is PAUL PELLETIER, who begins as EXILES new regular penciler with #69, on sale in September! Mike Marts: Paul, How did you get your start in comics? Paul Pelletier : After high-school, I worked with a few small independent companies in Maine, including one called Alpha Productions. 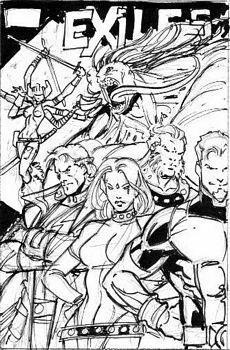 Through them, I started to make contacts in larger companies, and eventually landed a job with Malibu Comics where I could finally quit my day job (in a shoe factory) and work in comics full time. Ironically, my first book with them was Exiles (Editor Note: Malibu’s Exiles was a different version than Marvel’s current monthly comic of the same name). Mike Marts: Who are your major influences? Paul Pelletier : The major influences on my work obviously came from the comics I loved growing up. Guys like John Byrne, Alan Davis and Dale Keown are some of the bigger names. Other artists that had a big affect on me were those like Dave Cockrum, Kerry Gammill and Joe Staton. I always gravitated to artists who had clear storytelling and clean art styles with very expressive characters. I like artists who draw characters that can act. Mike Marts: Favorite comics character/sports team/movie/TV shows? Paul Pelletier : I love Power Man and Iron Fist, and The Goon. I've been a Boston Celtic fan since about 1980. You can find me at the movies for any Cohen Bros. flicks (Wes Anderson is also a favorite of mine!). Recently, I've become quite a fan of The Iron Chef. My fiancé doesn't get it. Mike Marts: What single work are you most proud of? 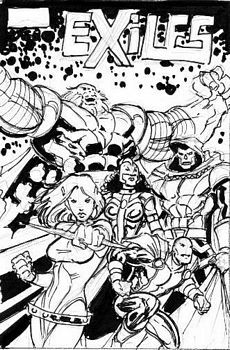 Paul Pelletier : It's a toss up between the GLA mini I did with Dan Slott and the Crossgen series Negation that I did with Tony Bedard. 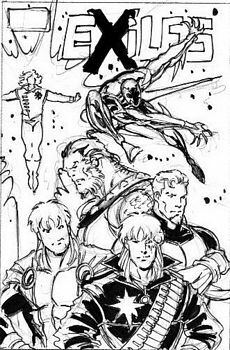 With GLA, I got to work on characters that I really got a kick out of back when they first appeared in WEST COAST AVENGERS. I actually turned down a high profile gig just so I could work on this mini series! With Negation, Tony and I had the freedom to do just about anything we wanted, so flexing our creative muscles proved to be a lot of fun! Mike Marts: Speaking of Tony, you’ve been a frequent collaborator with him—what is it about Tony’s work that you enjoy so much? Paul Pelletier : I think we have similar approaches as to the kind of comics we want to make. I really enjoy books with interesting characters, fun action sequences, a sense of humor, and as Tony would say, lots of " Holy $#!+" moments. Tony has an energy about him when it comes to creating a comic that is really infectious. After our time on Negation, I was hoping that I would get the chance to work with Tony again. Now we get to mess around with Marvel characters--and how fun is that! Mike Marts: What’s the best thing about working on EXILES? Paul Pelletier : Like Negation, the sky's the limit as to the kind of stories we can come up with. Exploring different realities has unlimited potential and the list of characters to play with is incredible! Not only can we come up with new scenarios, we can also explore classic stories with an altered reality twist. I am really excited about the possibilities of this book! Mike Marts: You’re exclusive with Marvel these days—how is this working experience different from past ones? Paul Pelletier : The biggest difference for me is that I am now working for a company that I was a big fan of when I was growing up. When I read comics, I almost exclusively read Marvel. There's more of a connection for me. I enjoyed my work with DC and Crossgen, but I am really thankful for this chance to work with Marvel. Mike Marts: Where you like to take your career in the years to come? Paul Pelletier: I just want to improve on my craft. I've been drawing comics for nearly fifteen years, and I've still got a lot to learn. I'm very lucky to have had a career this long, so I just want to steadily improve and tell really good stories. To me, that's what it's all about--spinning a great tale and having some fun while doing it! Mike Marts: Sounds great, Paul. Much thanks! Next week, we get to peer into the mind of X-MEN writer Peter Milligan!